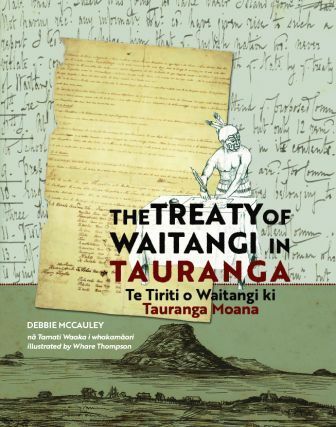 The story of Te Tiriti o Waitangi in Tauranga is a fascinating one, told for the first time in this bilingual picture book. 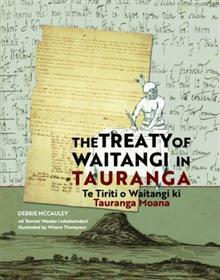 The document arrived in Tauranga after many years of violence and bloodshed had decimated the local population. Just days before the Treaty's arrival, a Tau... read full description below. The story of Te Tiriti o Waitangi in Tauranga is a fascinating one, told for the first time in this bilingual picture book. The document arrived in Tauranga after many years of violence and bloodshed had decimated the local population. Just days before the Treaty's arrival, a Tauranga chief was tricked into attending peace talks before being murdered and eaten. Not all the chiefs of Tauranga Moana signed the Treaty; those who didn't wanted to govern themselves, those who did were looking for protection against their enemies. However, just two years after the signings, three Tauranga Treaty signatories were murdered and eaten in what was one of the last cannibal feasts near Tauranga. CONTENTS: Otamataha Pa massacre and Herald visit; Treaty of Waitangi; Te Papa Mission Station; Murder of chief Ponui; Tauranga Treaty (Sheet 5); Nuka Taipari and Maungatapu Pa; Hori Kingi Tupaea and Otumoetai Pa; Missionary James Stack; Sack of Ongare Pa; Peace Treaty; Golden Age of Maori enterprise; New Zealand Wars; Tauranga Treaty of Waitangi settlements; Text of the Tauranga Treaty; Tauranga Treaty signatories; Tauranga Treaty witnesses; Tauranga Moana timeline (Early history, Musket Wars, New Zealand Wars, Treaty of Waitangi settlements) Glossary; Treaty activities and Index. Debbie McCauley is a librarian, author, and owner of indie business Mauao Publishing. Her book 'Motiti Blue and the Oil Spill: A story from the Rena Disaster' won the Best Non-Fiction category in the NZ Book Awards for Children and Young Adults, and along with 'Taratoa and the Code of Conduct: A story from the Battle of Gate Pa', was a finalist in the LIANZA Children's Book Awards. 'Motiti Blue' was also selected as a White Raven, one of 200 outstanding children's books published around the world in 2014, and by the NZ Blind Foundation to be produced in braille, large print and e-text. Debbie is passionate about writing stories from our own backyard for children in a bilingual, narrative non-fiction format. She has also had magazine articles, essays and poetry published.